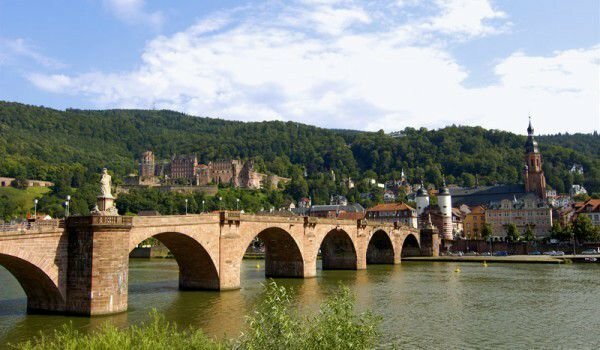 Along the Neckar River, in Germany you can see some of the most beautiful scenery in the country, such as the Heidelberg Castle. Neckar flows in the southwestern part of the country, springing from the mountain Schwarzwald (Black Forest), very close to Villingen-Schwenningen, located at 706 m altitude in the protected area Schwenninger Moos. The name of the Neckar River originates from "Nicarus" and "Neccarus", which comes from the Celtic "Nikros" and which can be translated as "wild water" and "wild man". For the most part, the Neckar River flows through the German state of Baden-Wurttemberg as a fraction of its current passes along Hesse. After its source, Neckar flows through pretty German cities , giving them irresistible charm. Among them are Rottweil, Rottenburg am Neckar, Tübingen, Wernau, Stuttgart, Ludwigsburg, Marbach, Heilbronn, Heidelberg, to arrive finally at Mannheim, where the Neckar River flows into the larger Rhine. Neckar is a major tributary of the Rhine. The length of the Neckar is estimated at 367 km. One of the nicest stretches along the Neckar River valley is its hills along the Odenwald (Odenwald hills), where you can see many historic castles nestled in the beautiful nature, or standing lofty on a hill. Among them are Hornberg Castle and Guttenberg Castle. After passing Heidelberg, Neckar River flows at 145 cubic meters per second, making it the fourth largest tributary of the Rhine and in general the tenth largest river in Germany. Along the Neckar you can see incredibly beautiful views, picturesque vineyards, green meadows, hills, including the picturesque castles along the river. Especially nice is the view of Heidelberg Castle and Old Town. In Heidelberg, 4 times a day tourist cruises leave along the Neckar. For centuries, the river Neckar is used for transporting goods and materials. From about 1100 the river has helped to transport logs from the woods of the Black Forest to the Netherlands. And now along the Neckar River are built large industrial complexes. Neckar is a navigable river from about 200 km upstream from Mannheim to the port of Plochingen. Some of the most important ports of the Neckar are those in Stuttgart, Heilbronn and Mannheim. One curious fact is that the name Neckar is given to the first motor boat in the world, constructed in 1886 by Gottlieb Daimler and Wilhelm Maybach, who tested their invention on river.